Came across these guys today at Chatham Militaria fair. File comment: Flyer for F.G. Crates. After a short chat they told me that they could do reproduction wooden 265 round, 50 cal boxes. They would come complete with stencils but the lids would be of a flush fit design until the correct wing type nut fixings were sourced. They are going to Rougham this weekend and are attempting to have a sample ready for then? A preliminary price was £25.00. So with baited breath I await the results. Apparently Lloyd you know them? 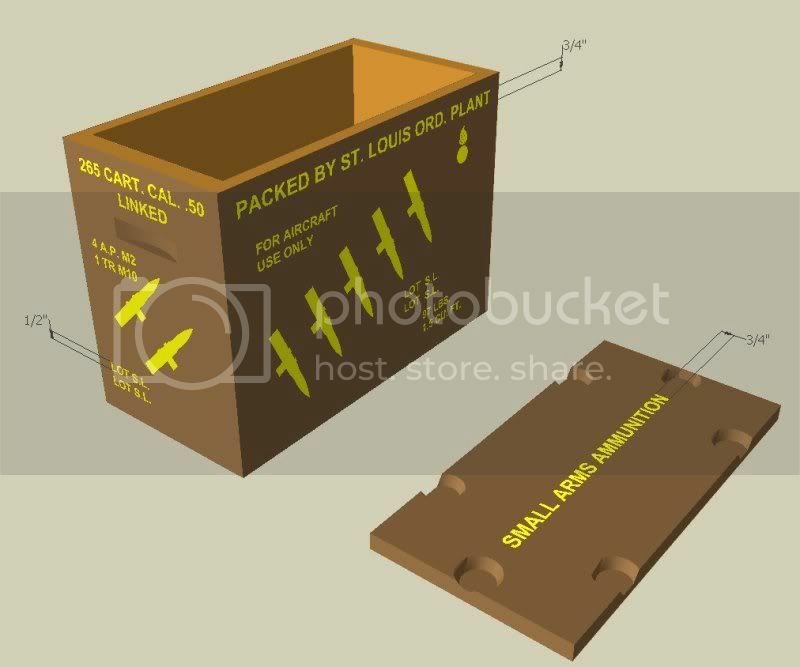 Can some one please post the correct details/picture of the stenciling needed for a 50 cal box described here. MIKE. Been chatting to the guys who are making these and they told me that there having trouble getting the base coat of the brown colour correct? So therefore any ideas of a RAL code or similar? If I could I'd keep it for myself. Just waiting to meet up with him when convenient. Can't wait as I've heard there not bad? Yeah Bodge, Martin's are not bad, some construction issues, and although he uses Axholme stencils, he doesn't fill in the bridges to make them look printed. That crate you overpainted and stencilled to Paul Bellamy's pattern looks ok, Better than it did with it's dodgy maroon stripe! Just fill in those joining bars on the lettering, and good luck with those pressed wingnuts!! I've noticed with the dozen or so that I've stencilled that less is more, the perky yellow paint really sets them out as a repro, my best ones are ones which look like they've had months outside in the St Louis sunshine! Hope these from F.G turn out ok, 25 quid is good, but I suspect it'll be a basic lookalike for that price. Me and 'The Burl' costed it all out, tried to make them cheaper, but the amount of work in them + materials made them more expensive. If people say they can do them cheaper, then good luck to them, but I suspect quality will suffer! Andy Burl's doing a second batch as we speak, I'll be getting them soon for final assembly, I'll put an advert on here when they're ready!